Exercise 1) Start at the red cone, sprint towards the blue cone on the angle, change direction towards the 2nd red cone. 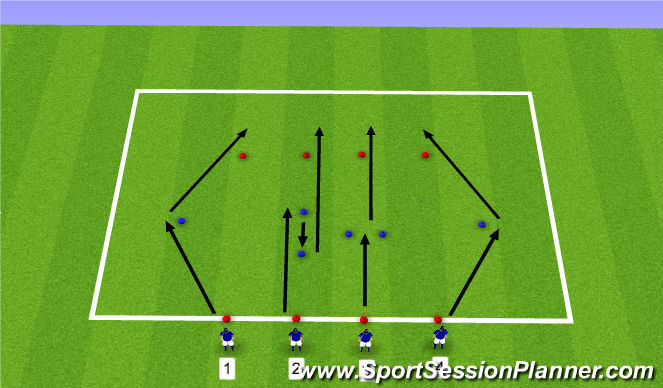 Exercise 2) Start at the red cone, sprint towards the 2nd blue cone, backwards towards the 1st blue cone, then explode out to the 2nd red cone. Exercise 3) Start at the red cone, sprint out to the blue cones, stop dead in the middle of the blue cones, then explode out past the 2nd red cone. Exercise 4) Start at the red cone, repeat the same exercise as Exercise 1) But move out to the opposite angle.